This was my 1st year doing to the WSOP and I couldn't ask for a better time. It has been the coolest and funnest job I've had. After getting back to Folsom I applied at Red Hawk casino in the poker department. I told the supervisor that I just came back from Vegas dealing the WSOP and was hired right then. At the Casino College Casino School we will train you for an EXCITING, FUN & HIGH PAYING Career working as a Casino Dealer anywhere from big name Casinos to Cruise Ships to Local Card Rooms & Indian Casinos. The Casino Gaming Industry is growing at a rapid pace and new casinos are being built daily, creating countless new Casino Jobs. We are Northern California's oldest and most respected Casino School & the World's Largest Casino Dealer Training Company with Schools in the San Francisco Bay Area & Sacramento. We also have affiliate Casino School campuses in Phoenix, Los Angeles and Singapore (via AGMI International) - In fact, we are the ONLY Casino School in the United States with International Campuses. The casinos listed below are currently hiring all dealers, all games! Deal all the games in the casinos!!! Don't wait, the Casinos are hiring RIGHT NOW! Call and ask about single game prices (as low at $149.00 per game). The FIRST 8 STUDENTS TO ENROLL BY December 15, 2018 (or the next 3 weeks) will get this deal for the low price of $595.00! 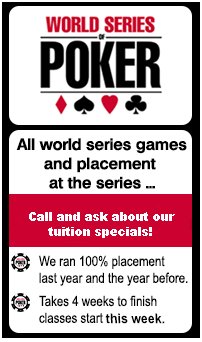 The first 8 students to enroll by December 15 for our ALL GAME PACKAGE will also receive our WORLD SERIES OF POKER TRAINING CLASS (A $795 value) ABSOLUTELY FREE!!! This includes ALL WORLD SERIES GAMES! Dealer training that will prepare you to be a dealer at the World Series of Poker this summer!! This is an incredible opportunity that includes job placement assistance at this year's WORLD SERIES OF POKER!! 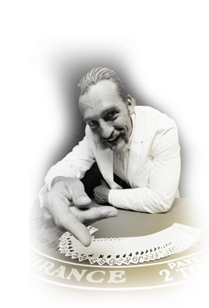 Remember, not only will you be training hands-on with top professional dealers in California during your class...but you will have the opportunity to work casino parties for the largest casino party company in California at $20.00 per hour plus tips, while you are training to be a professional dealer. We are the only school that guarantees placement if you get the all games package or your money back! This is an GREAT DEAL with HUGE SAVINGS!! Contact us today to reserve your seat BEFORE THEY'RE ALL TAKEN! I am now employed at Jackson Rancheria as a poker dealer! I haven't even graduated yet and I have the job that I really desired and, I didn't even have to go out and look! Thanks California Casino College!